We hope many of our friends, made through bellringing and former inhabitants of Ballymena now exiled eslewhere, will derive some pleasure renewing old memories by this modern means, and more particularly rekindle those friendships. We also look forward to making many more new friends and contacts. The Ballymena Parish in the County of Antrim, Northern Ireland, is a Union of the ancient Parishes of Kilconriola and Ballyclug. It was through the efforts of the then Rector the Rev Dr Wm Reeves a noted Scholar and Antiquarian that the Parish Church was built on the present predominant site at Castle Street in Ballymena. The Foundation Stone was laid by Colonel A Shafto Adair, High Sheriff of the County and generous benefactor to the Parish, on St Patrick's Day 1853. The building was completed at a cost of about �5,000 and consecrated on Thursday 2nd August 1855. Unfortunately on December 13th 1879, the Church was totally destroyed by fire, but within fifteen months was rebuilt in the same lines at a cost of between �8,000 and �9,000, and re-opened on 24th March 1881. During this time, the West Presbyterian Church accommodated the congregation for Services. The original ring of 8 bells, total weight 76cwt 1qr 21lb (3,883kgs), was installed in the tower in 1895, Tenor weight 17cwt 2qr 19lb (897kgs). Due to the deterioration of the oak frame on which they were rung, the bells were removed just after Easter 1987, sent off to the original Bell Founders, Mears and Stainbank of Whitechapel Foundry, London, were melted down and re-cast into a ring of 12 bells, (Tenor weight 14cwt 2qr 17lb (744kgs)) and re-installed in the Tower in time to ring in the New Year 1988. 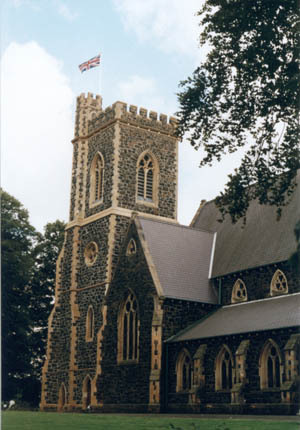 The bells were re-dedicated on Saturday 19th March 1988. This is the only ring of twelve bells in N. Ireland hung for full circle ringing. The only other twelve being in Dublin's St Patrick's Cathedral and more recently Christ Church Cathedral, Dublin, now with sixteen. Regular ringing for Services continues to be the main activity for the local band. Peals and quarter peals by locals and visitors are listed elsewhere on this site.